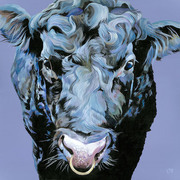 Ruby is one of the most popular cows in the Lauren’s Cows herd. This Ayrshire with her beautiful Ruby red coat has such a welcoming face that you can’t help but fall in love with. Works wonderfully as part of herd with other neutral background images, such as Chieftain.